Price: - Rs.990/- for 3g. Color plus texture for the lips. Stands out on the runway. Simmers on the street! What made M•A•C famous. To see the ingredients please look at the picture. 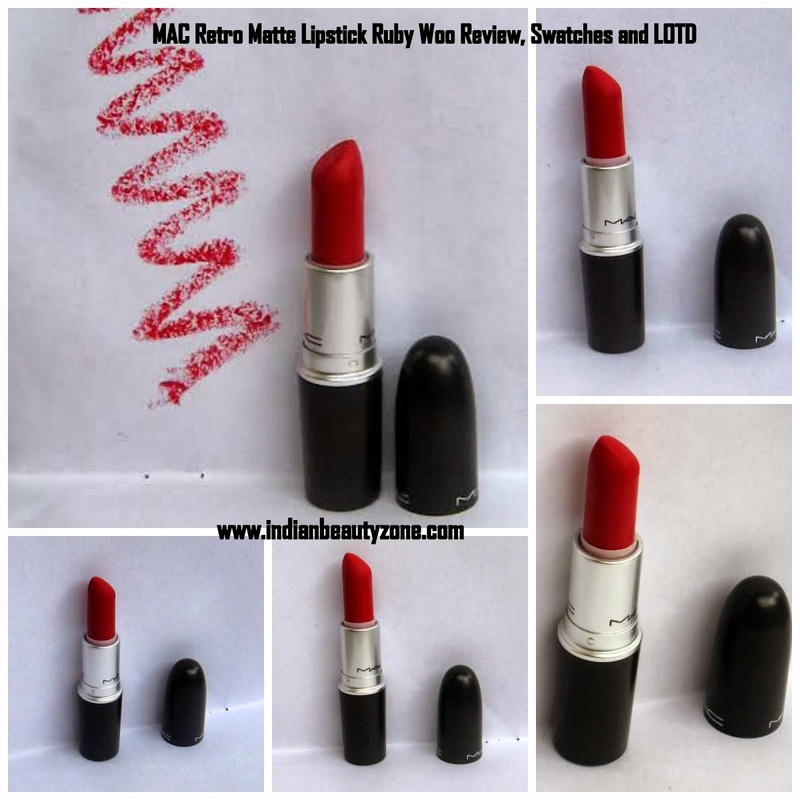 Mac retro matte collection lipsticks are super matte and so are the ruby woo. 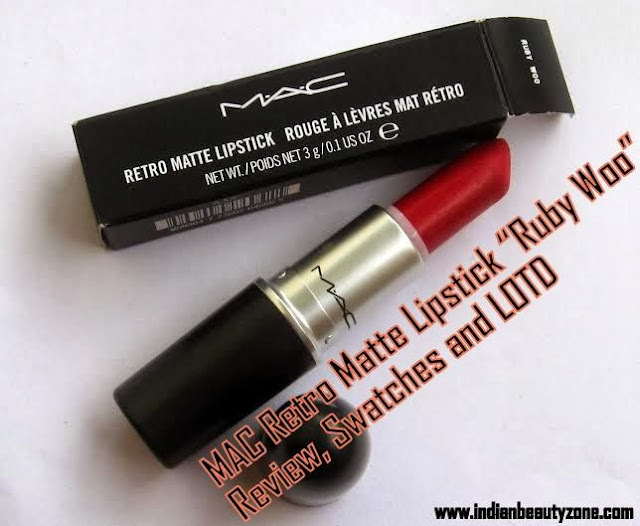 It is super matte so one has to be very careful with this lipstick as it might end up looking flaky on lips. So exfoliation and moistening of lipstick before applying the lipstick is suggested. 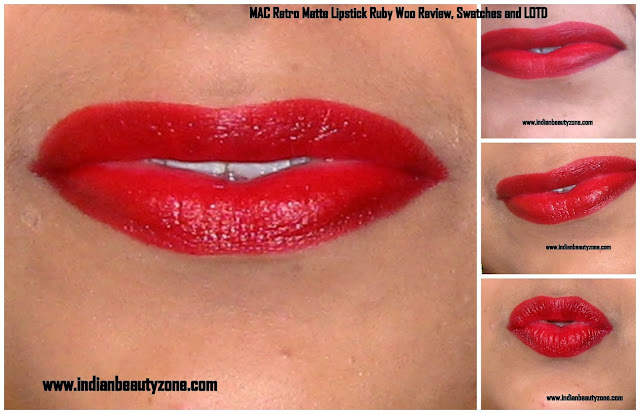 But I am a matte lover so I think Ruby woo is just perfect for my choice. The shade is “blue base red” so I think this kind of shade will look good on any skin tone, only one should have the confidence to carry it. As winter is here so it’s the ideal time to wear red. But the lipstick being super matte may tends to tugs or pulls the lips during application so whether its summer or winter application of lip balm before applying the lipstick is suggested. The lipstick being matte doesn't transfer into cups and mugs and so it doesn't left the history of your where about. • Have variety of shades. • Excellent coverage of pigmented lips. • Stays near about 7 hours without fading. • Leaves a nice red tint after fading. 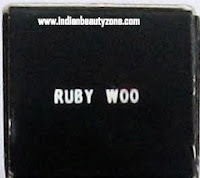 • The formula is super matte which lead to super drying of lips followed by accentuates fine lines of lips. • The lipstick tends to tug your lips while applying. 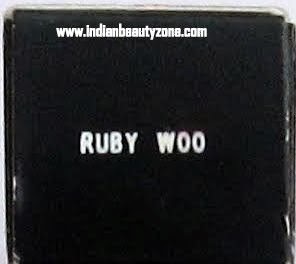 • Availability might be a problem as it is the hottest selling shade; in fact I have to pre-book this lipstick in our Kolkata mac store before to get it. My ratings:- 3/5 due to all cons. If you never wear red or want to play safe with red then try this hot shade , I bet it is the most versatile shade that will suit everyone from fair to dusky, but like I said before all you have to need “the confidence to wear it”. Till then stay healthy and don’t forgot to leave your precious comment below to show some love. 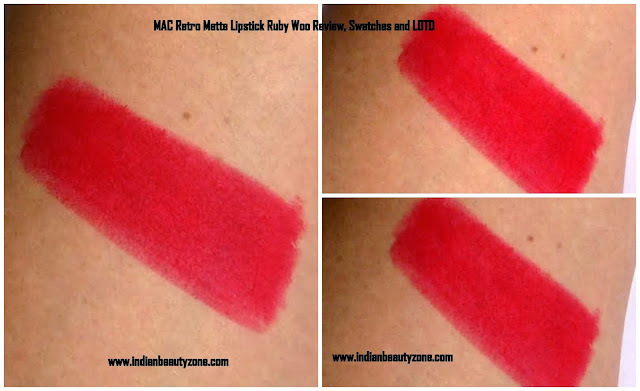 Lovely review, lovely swatches dear. Ah! This is such a cult favorite and one that looks extremely pretty on u Sammy! Loved the review n pics! Very pretty reds! 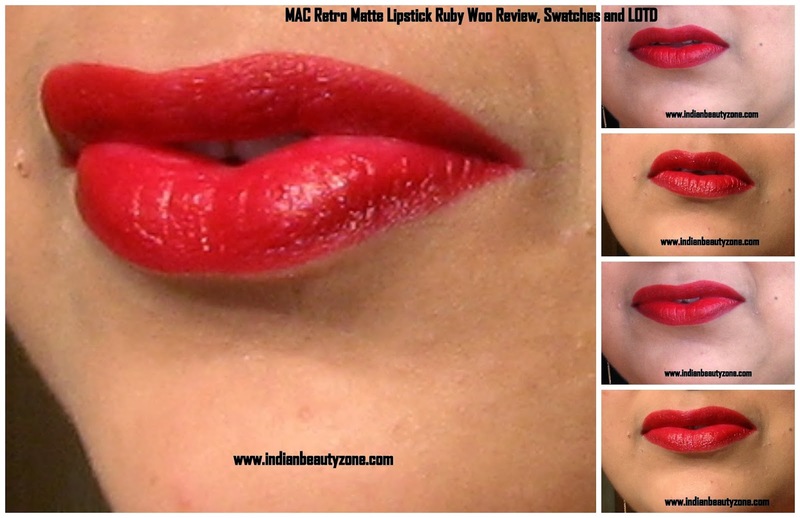 You have such great lips for red! Its such a great shade.. i don't think I can carry it off well.. Seriously such a great shade.. It looks awesome! Wow.... I love this hot shade!!!!!!!! Ok, I need a red lipstick! I have dry lips, so I think I have to skip it. Lovely LOTD. Thenred lipstick is Fantastic on you! Ruby woo is just a stunning shade!!!! I have this shade and love it, it looks pretty on you, xoxo. lovely! I have Russian Red which is a bit darker. I love this color hoping to purchase soon. Lovely review and beautiful images.